While wedding season has now expanded well beyond the beginning of summer, engagement season is still decidedly fixed with the holidays—running from Thanksgiving through Valentine's Day. As we close out the year and proposals are on the horizon, what better time to consider emerging engagement ring trends and the styles that will rule 2018? 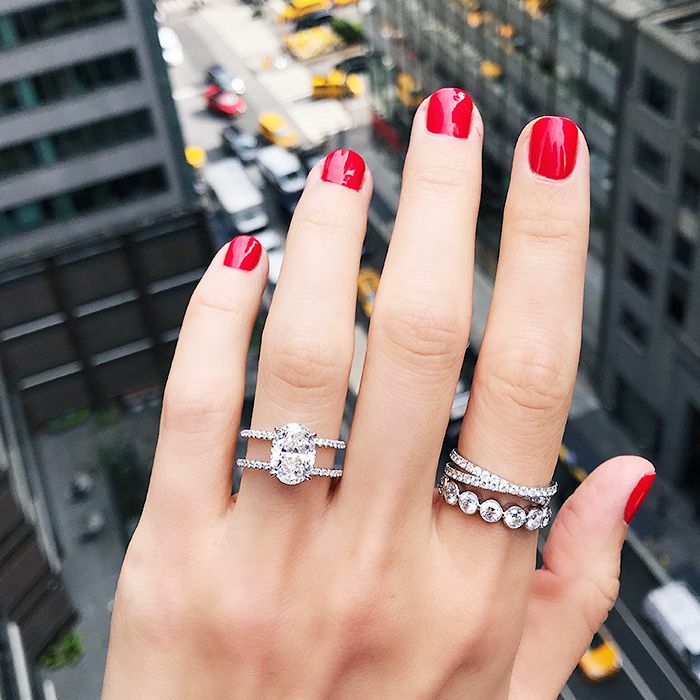 We reached out to Nicole Wegman of Ring Concierge, a private jeweler by appointment in New York City, to find out the most popular engagement rings right now. Ring Concierge boasts a covetable bridal collection of distinctive pieces that range from timeless to trend-forward. Wegman gave us the low-down on the best-selling pieces and emerging engagement ring styles that are having a moment. From the diamond shapes that are making a comeback to settings that keep antique diamonds modern, find out the engagement ring details that are seeing a significant spike in interest. Keep scrolling to discover the engagement ring styles fashion girls are loving. "Ovals are one of the most popular shapes right now," notes Wegman. "Our clients love that they give the illusion of a larger carat weight because they’re so elongated. A double band is a really cool way to put a twist on a classic setting because the diamond almost looks like it’s floating. Plus, it’s an engagement ring and wedding band in one!" "Emerald cuts have very clean lines are perfect for a modern aesthetic," says Wegman. "We love adding trapezoid side stones to make the overall ring appear larger, and they also create a very geometric shape. "Antique diamonds are making a comeback!" assures Wegman. "But we like keeping the look fresh by mounting them in a modern setting, like our signature Chloe ring. This the perfect solution to prevent it from looking like your grandma’s ring." "Pears are making a major comeback and are perfect for the girl who loves oval but wants to something more unique and sophisticated," explains Wegman. "They are also one of the most flattering shapes because they elongated the fingers. We like adding that extra glam factor by blinging them out with a micro-pavé halo." "We’ve recently seen a spike of interest in colored diamonds, but they are much more expensive than white diamonds," notes Wegman. "This ring features a white radiant center stone, but we added a pop of color by adding pink diamonds set down a rose gold band. This makes them much more affordable but still gives a pop of color." In the market for an engagement ring? Study up on every type of engagement ring cut worth knowing.